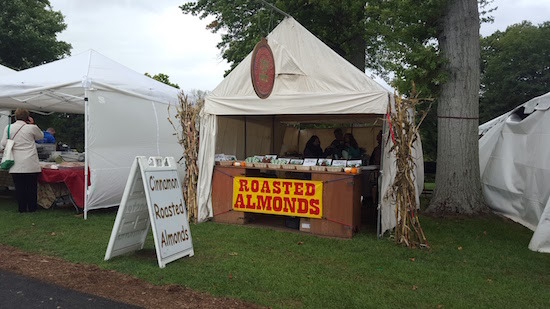 One year ago, I spent an afternoon at Oglebayfest’s Artists’ and Gourmet Market. 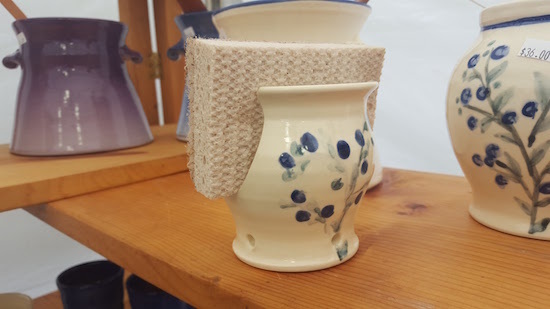 Soon, it will be that time of year again, so take a moment to read about my 2015 experience and get yourself all geared up for another weekend of crafts and creations on the hill! The Phil Maxwell Artists’ and Gourmet Market is my favorite component of Oglebayfest. As a child, I remember a tent that sold sheepskin slippers, a man who built and played Appalachian dulcimers, and glorious food. The market has been showcasing the best of West Virginia’s artistry for decades. In the time it takes me to drive up the hill on Friday, the weather goes from hideous to appalling. Nevertheless, people have flocked to the site. I stop first at Summer Hollow Pottery by Wendy Summers, from Wallback, WV. We talk about the process of becoming an artist, which isn’t all that different from becoming a writer. She tells me that people love the sponge-holders she’s created. What a wonderful coincidence—my sponge desperately needs to be held! It’s just been lying there in the sink lately, musty and alone. Nature Painting by Sue Smith catches my eye next. Sue is from the area, and her owls stare out of the canvas. “I love owls, so I’ve painted a lot of them,” she says. 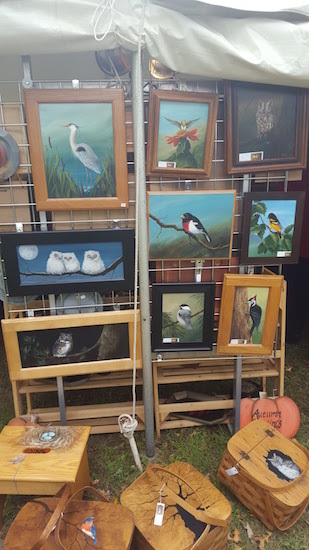 “Any time I paint a great blue heron, I always sell that, and people love the woodpeckers.” Sue teaches art, and this is her tenth year at Oglebayfest. These are some good-lookin’ owls, and her paintings are also available in the Samara Shop at Oglebay Institute’s Schrader Environmental Education Center (another must-see during Oglebayfest). I’m coming back on Sunday to get a hooter for my office wall. The artists are myriad. Cindy Roberts of Raggedy Edges can make a stuffed animal out of a flannel shirt. Alan Fitzpatrick, a local author, lets me leaf through his new book, Place of the Skull, in which he’s written an account of “Weelunk,” the Delaware word for “Wheeling.” I sniff handmade soap from Morgantown, pick out some earrings for my mom, and knock over a wooden scarecrow. Nobody seems to notice. The director at Oglebay Institute’s Stifel Fine Arts Center, Rick Morgan, gets excited about the market every year, and he works hard to continually improve the experience. This year he tells me about some new additions, including blacktop in the parking area, and a more level grade on the top of the hill that increases the space for tents. Additionally, through the Wheeling Arts and Cultural Commission, artists and market-goers will enjoy live music throughout the weekend. He also knows that everyone will be especially pleased with the bathrooms. “Typically, we’ve always had porta-johns, but this year we [have] a really fancy porta-john trailer. We’re trying to increase the quality of the experience for everybody.” Rick may laugh at my including this in the blog, but he’ll also never know how much ladies will appreciate this particular upgrade; it’s like a moment of zen in there. Though the artists account for three-quarters of the tents at the market, the “gourmet” component proves just as delightful. I see fudge, salsa, fruits and berries, and soup mixes all within ten feet of where I’m standing. Since I’m here alone, I decide to skip my annual gluttony at the wine tents, but I do visit Thistledew Farm’s honey-tasting station. They’ve brought their bees with them, and I’m always excited to see local bees. And though it’s getting colder, the crowds continue to grow and the line for bratwurst lengthens. As I walk back through the market a second time, the popcorn line now stretches ten people deep. The Cheese Melt is here, and the nut folks, Yinz r Nuts! On Sunday when the weather clears, thousands of people will arrive. Back at Summer Hollow Pottery, I stop to buy the sponge-holder. And a coffee cup. And what’s this chicken dish thing? Apparently I can impale my chicken with this piece of pottery and steam it from the inside. It’s brilliant. Besides, I’ll need something to clean with my sponge, now that it will be emotionally fulfilled. 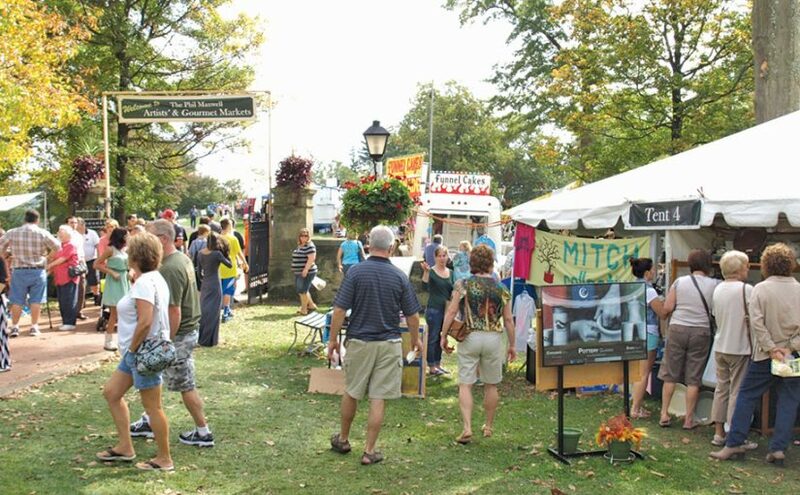 The Phil Maxwell Artists’ and Gourmet Market will be open October 7 through October 9 at Oglebayfest, behind the Mansion Museum. Hours are noon – 7pm Friday, 10am – 7pm Saturday, and 10am – 5pm Sunday. Free admission.